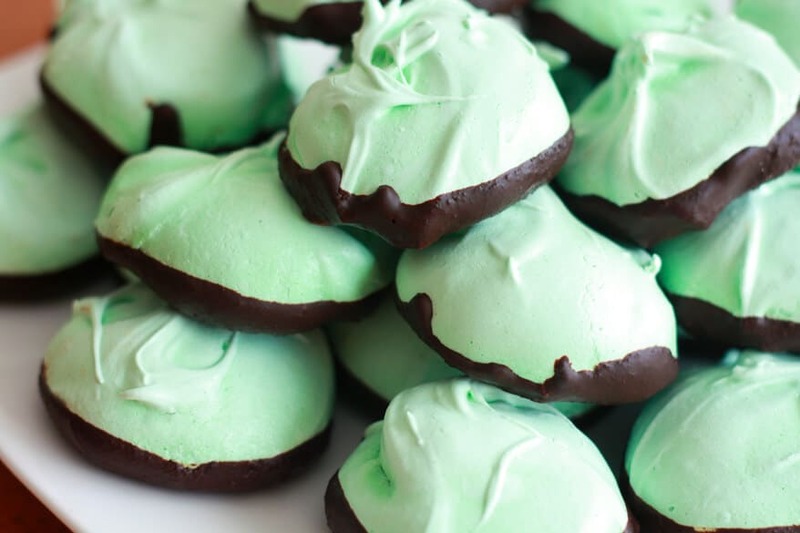 Mint-flavored meringues dipped in chocolate. The perfect treat for St. Patrick's Day or Christmas! Place the egg whites in the bowl of a stand mixer with the wire whisk attached. Beat on medium speed until foamy, then add the cream of tartar. Increase speed to medium high and and beat until soft peaks appear. While continuing to beat, add the sugar gradually in a stream. Continue beating until stiff peaks form. Add the vanilla extract, mint extract and green or red food coloring and beat just until combined. Drop spoonfuls of the egg mixture (2 inches in diameter) onto either a baking sheet lined with parchment paper, or a very lightly greased nonstick baking sheet. Bake for 2 hours or until no longer sticky, then turn the oven off, leaving the baking sheet with the meringues in the oven to cool completely. For the dipping chocolate, place the chocolate squares in a double boiler over boiling water and melt completely. Dip the bottoms of the cooled meringues in the chocolate, shaking off the excess, and place the meringues upside down on some waxed paper to dry completely. Or dip the chocolate bottoms in crushed red or green candy canes before allowing them to cool. Store the meringues in an airtight container and keep in a dark place that doesn't reach extreme temperatures. Will keep up to two weeks.